Eleventh seed Phillip Higgs (AUS) stunned top seed Peter Adrigan (GER) to win the Men's 65's World Championship title today. Higgs only plays ITF tournaments within Australia and was only nominated as the Australian Britannia Cup team's number three player. By comparison, Adrigan will finish 2009 as the World number one, was top seed for this event and beat Higgs' Britannia Cup team-mate Dennis Bindon 60 61 in the semifinal. Higgs took the first set by the slimmest of margins on a tie-break, 76(4). Adrigan was expected to pull away in the second set, but despite having a set point, the German was unable to shake off the dogged Australian. Higgs forced a second tie-break, winning it 76(6), and with it, the title. Ellie Krocke (NED) won her first World Championship singles title in nine years today, as she claimed the Women's 65's crown. Her opponent in a high quality final was nine time World Champion Heide Orth from Germany. Orth had beaten her opponent once already this year, but she went into the final off the back of two draining three set matches. Meanwhile, Krocke had glided through the bottom half of the draw, dropping just seven games in four matches. Krocke and Orth were only separated by one point in a tie-break finale to the fist set, with Krocke winning it. In the second set Krocke pulled away from her opponent to seal a 76(6) 62 victory. 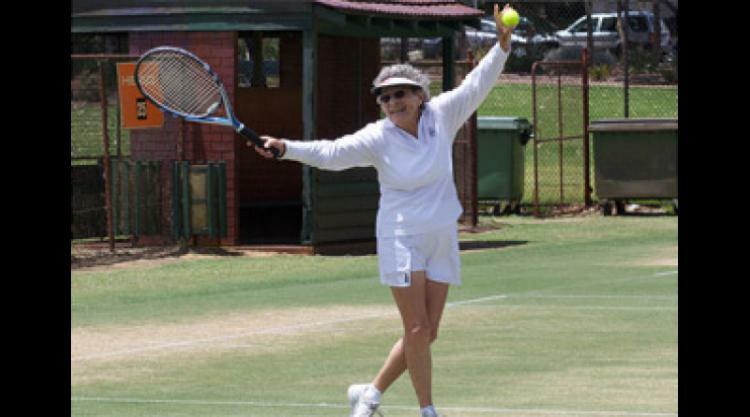 Another first-time singles winner was fellow Australian Kerry Ballard in the Women's 60's. Ballard had won the doubles with Liz Allan (AUS) yesterday afternoon for a record seventeenth consecutive time, partnering Liz Allan for the past nine of those titles. This time Allan was Ballard's final victim. Ballard started strongly, breaking Allan to take the first set 64. Ballard served for the match at one stage, but her more experienced opponent broke back and it seemed Ballard's chance may have vanished. But Ballard proved the stronger of the two ladies in the resulting tie-break to take her first title 64, 76(4). Ballard also captained the winning Australian team in the Alice Marble Cup and won the doubles and singles in the Individual Championships, giving her a unique 'treble' for the 2009 Championships. Like Ballard, King Van Nostrand (USA) was playing his first year in his age category, the Men's 75's. In a battle of the towering Americans King Van Nostrand defeated big serving compatriot John Powless 75 61 to claim his seventh World Individual Championship title. The first title of the women's to be decided this morning was the Women's 70's singles title. Janine Lieffrig (RSA) successfully defended her title, defeating unseeded Mary Gordon (AUS). The former World number one completed a straight sets victory, 64 62, thoroughly deserving her fourth World Championship singles title. After Higg's & Ballard's victories, Australia enjoyed more success as Margaret Robinson added a fourth title to her collection, taking just two sets to defeat top seed Mary Boswell (USA) in the Women's 75's. The singles final was a repeat of their meeting in last week's Queens' Cup final. On that occasion Robinson won comprehensively. This week Boswell provided a much sterner test for Robinson, having benefitted from a second week playing on grass. However, Robinson proved just a little too strong for the American, winning 75 64 to successfully defend her 2008 crown. Rita Price (USA) claimed the first World Championship singles title of her career as she defeated Briton Betty Howard 61 64 in the final of the Women's 80's. Hans Adama van Scheltema (NED) took his first World Championship singles title with a dominant display in the Men's 60's event. Adama van Scheltema did not drop a single set throughout the tournament, defeating Terry Smith (AUS) in the final 60 63. Another first time singles title winner was American Fred Farzanegan in the Men's 70's. Fourth seed Farzanegan was the nominal favourite from the early rounds as the top seeds around him fell to the wayside. Farzanegan was still forced to work in a high quality final, as Australian Bruce Rehn pushed him all the way. Farzanegan was forced to battle back from a set down and he eventually triumphed 16 63 75. Fifth seed Harward Hillier (AUS) claimed the host nation's fifth and final individual gold medal of the Championships in the Men's 80's. Hillier clinched a decisive third set in a close match against American top seed Clem Hopp, winning 62 36 63 and capping a fine day for our exceptional hosts.